Description: Explore the mysterious fashion of the Venice Carnival with Audrey! 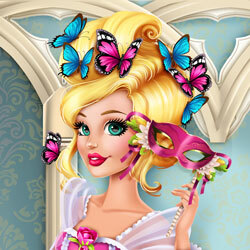 Dress up the glamorous fashionista in one of a kind ball gowns inspired by the carnival and don't forget to accessorize. Masks, dresses, fans, fabulous makeup and hairdos are all important for a successful Venetian costume, combine them to create your very own.